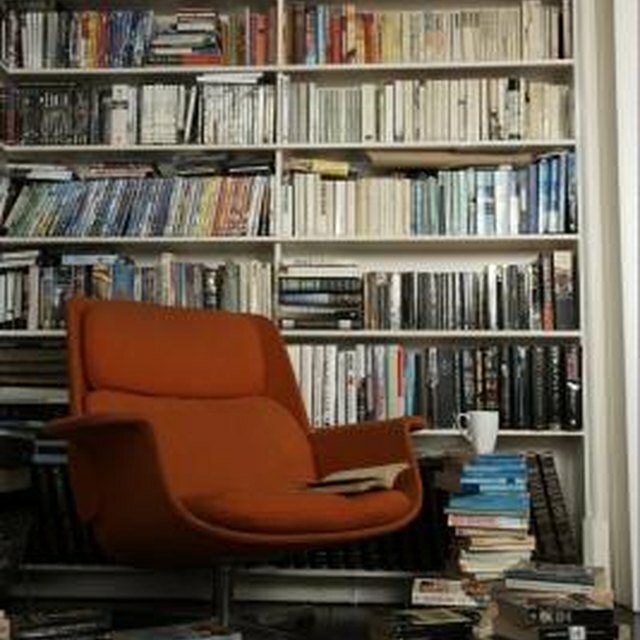 Because bookshelves come in varying heights, you may have one that isn't quite tall enough for your use. Whether you need to store more books or you are looking to fill up the space along one wall, you may find that you would like a bookshelf that is taller than the one you have. Instead of buying a taller one, you can make the one you have taller by building an addition to its top. A simple addition can make your bookshelf taller. Measure the size of the existing bookshelf so you know what size boards you need. You will need to measure the width of the bookcase, its depth and the thickness of the boards already used. Measure two boards out to the length you want to expand your bookshelf. For instance, if you want to add 12 inches to your existing bookshelf, you need two boards that measure 12 inches. Mark the length with a pencil, and saw the boards to size. Measure one board to fit across the top of the bookshelf. This board will measure equal to the existing top board of your bookshelf. Mark the length with a pencil, and saw it to size. Cut any shelves you want to add to the bookshelf. The shelves will measure the same as the top piece. Stain all of the wood pieces to match the existing bookshelf. Allow them to dry before putting them together. Lay the three boards in the shape of a squared "U" on the floor so they stand up on their thickness edges. The top board should be between the two side boards so all edges are even. Nail the three boards together with a hammer and nails. Cut a piece of plywood board to fit across the back of the new addition for the bookshelf. The plywood creates a back for the bookshelf for stability. Stand the new addition on top of your existing bookshelf, lining it up so the edges are even and the "U" you created is upside down. Position four L-shaped brackets where the new and old bookshelves meet, two on each side. One bracket on each side should be near the back and the other near the front. Drill holes into the bookshelf to match the holes in the brackets so you can secure the brackets to the bookshelf. Insert the screws and secure them in place to hold the two pieces of the bookshelf together. Add any additional shelves into the new section using L-shaped brackets on the bottom of each shelf to hold it into place. Stain the plywood backing if desired. If the bookshelf has a decorative top, remove it from the top and install the new addition with the opening toward the top so you can reinstall the decorative top.